Greenaway's approach to the mother-daughter relationship tenderly reveals both sides of the coin. As a woman who lost her mother at a young age, I found her treatment of mothers, present past and future, sensitive and insightful. I also loved her story telling the multi layered levels of meaning. It's a wonderful, moving book. Daughters and mothers of all cultures will enjoy it. A beautifully wordcrafted story which intertwines the author's professional expertise in girl's anorexia with her personal experiences of Aboringal desert women's values acting as as foil to that of her own culture. The word pictures of spaces and places in the desert are intimate in observaton and poetic in their description. The story of Diana's spiritual journey and growth in her personal strength was absorbing as were the insights into the plight of sufferers of anorexia, the landscape of Aboriginal desert communities and awakening to the richness of their women's rituals. Thank you Denise, I read this book feeling as though I was there with you on this journey. 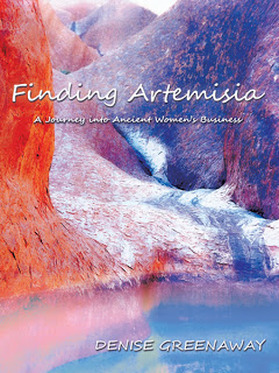 Finding Artemisia is studded with invaluable insight and is written with clever clarity and compassion. While the author superbly captures the spirit of 'journey' and adventure, healing and culture, the reader is carried along by the charm of the narrative. This is a moving and genuinely uplifting story embracing the engaging and important themes of anorexia, ethical sensibility, ancient indigenous ceremonial practices and personal growth. I loved this book - it somehow feels important and very special. A wonderful initiation into the healing power of the dreamtime. There's no way you can read this book and not slip into the in-between worlds where magic really does happen. Greenaway creatively weaves a gripping and compassionate tale involving a very real life problem, effecting many young women in our society today, into a journey that takes the main protagonist Diana, to the central desert of Australia. It is here where she meets with the indigenous women and is ceremoniously introduced to the Ancient Healing Wisdoms. Greenaway shows very courageously the interconnectedness of Diana's life and that of her patient, Artemisia. Diana's genuine care for Artemisia and her soulful desire for her healing goes far beyond the expected. A truly touching read which will extend the boundaries of your inner realities. I bought two copies of Finding Artemisia: one for my wife, because our daughter had anorexia and one for my sister, because her daughter once had bulimia. We all agree it was a fascinating read and clever in the way that it took you into a culture that never had anorexia or body image problems. We all appreciated the way the mother was portrayed too, because often the mothers of girls with ED's are demonised but in fact they feel so helpless. But you don't have to have had an ED to enjoy this gripping story. I would recommend it to anyone who enjoys great characters, suspense and an adventure into the Aussie outback. I was captivated by this book from start to finish. The imagery made me feel as though I was there, experiencing this amazing journey. A beautiful insight to the women's mysteries and how we can each learn from the wisdom and use this to positively enrich our own lives. I bought it for my 30 year old girlfriend who is a dancer and has had first hand experience with body image issues. She especially loved the dance scenes with the Aboriginal women, where the dance is not a performance but a sacred celebration of the female spirit. She was moved by the book and it gave her hope in healing her relationship with her mother. I have just finished reading this marvelous book . The ideas expressed in this book refer to all women , girls, daughters , aunties, mothers and grandmothers in contemporary times and even more fascinating is the story of the ancient aboriginal women. The description of Australian desert landscape is superb! I would highly recommend this book. Just finished reading this book, and loved it. It gives a wonderful insight into the life of anorexics, lesbians, psychologists and Australian aboriginal woman. Not a combination you come across often!!! The story is beautifully told and interspersed with fabulous and thought provoking poetry. I have to say that I was thoroughly disappointed to find I was at the end of the book :) Roll on the next one. I downloaded this new novel and I'm HOOKED! And trust me, I'm a harsh critic. I'm very impressed and really enjoying the read. Sophisticated yet laconic, totally UNmawkish, and the kind of Australian fiction I really enjoy reading. Finding Artemisia is a page turner. I bought it for my mother, but I really enjoyed it too. Before reading this novel, I knew nothing about anorexia or traditional Aboriginal custom, so I found it very informative. But it is also really enjoyable. I was particularly pleased with the way the main male character was portrayed. I have just finished reading "Finding Artemesia" and I absolutely loved it. A wonderfully healing story that touched on so much - I highly recommend this book.